Today is Your Day to Dance Lightly with Life. It Really Is. Welcome to my store -- all my books, training, and posters, plus many affiliate products and services, all in one place. Thank you for visiting. As as "thank you," please enjoy the free ebook at the bottom of this page (no email address required). 1. Understand the role your past plays in triggering your current emotional state. 2. Access the power of forgiveness and gratitude to create happiness. 3. Establish a framework for designing your inspired future. Your 49 Lessons of the Regaining Your Happiness program will be delivered by email each day for the next seven weeks. 100 Secrets for Living a Life You Love - You can live the life you love - even in the face of the most challenging circumstances. While sometimes it may appear that life throws more obstacles in your path than you can handle, you can always choose to be happy. Yes, you are that powerful. or buy direct from my publisher. Regaining Your Happiness in Seven Weeks: A Training Program is also available as a printed book with the same 49 Daily Lessons as the on-line e-Training program. Simply an Inspired Life is Your Life Guide to Consciously Choosing Unbounded Happiness in Good Times and Bad guides you in Breaking the Cycle of Self-Inflicted Suffering and building upon the Eight Points of An Inspired Life: HONOR for true self, FORGIVENESS for self and all, GRATITUDE in everything, CHOICE with open mind and heart, VISION with powerful intention, ACTION with bold courage, CELEBRATION with joy, and UNITY with all creation. This book of inspiring quotations contains 36 large full-color images with quotes inscribed, plus a collection of quotes selected to address both the realm of the spirit and the concerns of everyday living. These quotes span the millennia from Confucius to Martin Luther King, Jr. - from Aristotle to Albert Einstein - from St. Francis of Assisi to Mother Teresa - and include a number of my own sayings. This book of quotes for joyful living contains 36 large full-color images with quotes inscribed, plus a collection of quotations that address the issues of living a life of courage, joy, and purpose. These quotes span the millennia from Lao Tzu to Gandhi - from William Shakespeare to John F. Kennedy - from - Leonardo da Vinci to Helen Keller - and include a number of my own sayings. Angels can fly because they can take themselves lightly. This book of love and celebration contains both inspiring and humorous quotations, plus 36 full-color images, many with quotes inscribed, These quotes span the millennia from Plato to Mae West - from William Shakespeare to Oscar Wilde - from John Keats to Mary Anne Radmacher - and include a number of my own sayings. Each of the books and videos below has left an important mark on my life. I recommend them to anyone interested in following a path of inquiry. If you are interested in acquiring any of these books or videos, you support Daily Inspiration - Daily Quote by making your purchase at Amazon's discount price through the links on this page. 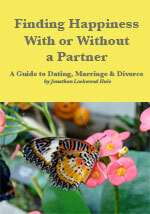 This 48-page eBook contains articles on Dating, Relationships, Marriage, Troubled Marriage, Separation, Divorce, and Beyond Divorce.